There was anger today at the news this morning that energy companies' profits had soared eight-fold from £15 to £125 per customer per year, reports Shamik Das. There was anger today at the news this morning that energy companies’ profits had soared eight-fold from £15 to £125 per customer per year. Friends of the Earth said it was “outrageous” the energy fat cats were raking in the profits while people face “rocketing” bills and “shiver in cold homes”. “It’s outrageous that Big Six profits are soaring while families across the nation struggle to pay rocketing fuel bills and shiver in cold homes. Energy regulator Ofgem, which revealed the figures, has called for “radical reform” of the energy sector, so we end up with a “simpler, more competitive energy market”. They plan to reform the system to ensure “simple tariffs, clearer bills and annual statements” for customers. • Standardised price information will allow consumers to compare easily standard and more innovative tariffs. Much as it pains me to support the energy companies, you are being disingenuous with your statistics at best. While the change in how much profit per customer the companies are making sounds really impressive if it is said to be from £15 a year to £125 a year – this isnt a year on year change. The £15 a year profit margin refers only to a single month in the summer, when their profits are at their lowest. Remember that in essence, they are paying for capacity at that point in the year which is not used, until the winter. The figure which should be used is one of £90 a year, for the same time LAST YEAR. Compare that to a figure of £125 a year, which does show an increase that should be challenged – but not as drastic as you make out. How can the government and people alike be so deluded as to think that making tariffs clearer will bring the cost of bills down. Making the tariffs easier to understand does not deal with the underlining issue, which is we are all getting ripped off,and the the government are powerless to do anything about this. Am i the only one who can recognize that the endemic collusion among the so called big six does not allow you to get cheaper prices.The government should stop talking about easier tariffs and grow a back bone and,either admit that they are powerless,or force these greedy companies to lower their prices. A vast amount of cheap natural gas in the form of shale has been discovered in north-west England, an estimated 200 trillion cubic feet of shale gas, and according to the British Geological Survey, shale gas resources under the North Sea could dwarf on-shore supplies. 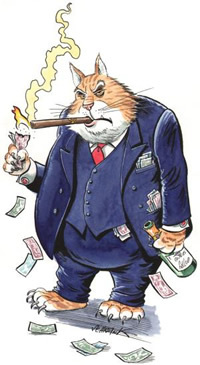 Now if the Government could prevent the fat cats from profiting from shale gas by not allowing them to own the rights to shale gas resources, then the competition with new shale gas companies would have the potential to force down prices, end fuel poverty and save the economy. If I were trying to work out whether they are ripping us off I would look at the level of the profits over the course of a few years, rather than the degree of fluctuation within a year. RT @leftfootfwd Watching #Newsnight? U'll b interested 2 hear energy companies' profits r up 733%… http://t.co/ULuFItHx > I feel sick!